After two New York Times best sellers, Nick Offerman returns with the subject for which he's known best - his incredible real-life woodshop. Now Nick and his ragtag crew of champions want to share their experiences of working at the Woodshop, tell you all about their passion for the discipline of woodworking, and teach you how to make a handful of their most popular projects along the way. This book will take listeners behind the scenes of the woodshop, both inspiring and teaching them to make their own projects and besotting them with the infectious spirit behind the shop and its complement of dusty wood elves. In this audio you will find a variety of projects for every skill level, with personal, accessible instructions by the OWS woodworkers themselves. You will also find writings by Nick, offering recipes for both comestibles and mirth, humorous essays, odes to his own woodworking heroes, insights into the ethos of woodworking in modern America, and other assorted tomfoolery. Whether you've been working in your own shop for years or just love Nick Offerman's brand of bucolic yet worldly wisdom, you'll find Good Clean Fun full of useful, illuminating, and entertaining information. What did you love best about Good Clean Fun? I had no idea what to expect from a woodworking audiobook. I mean, was it going to be instructional? how to join wood? how to build xyz? Was it an autobiography? "This is how I got good at woodworking"? Was it going to be a Q and A session? Although I wouldn't classify myself as a Nick Offerman fan from television or standup or any of his other appearances, I was intrigued. What could THE Nick Offerman teach me about woodworking? and more importantly, could he keep me awake through it? Well, I was pleasantly surprised that Nick provided a book STEEPED in woodworking history, and taught me a bit on how he (and his whole crew) came to the love of woodworking. He exalts all of the people around him and teaches us how he built his amazing woodshop. He adds enough humor, that will keep the listener entertained through the entire book. Nick teaches his listeners, the how and why of the love of woodworking. How to learn, how to grow, and how to achieve the best out of your own work. Nick has a unique voice... This completely lends to the book experience. I would choose his audiobook over the written one any day. What did you learn from Good Clean Fun that you would use in your daily life? Enjoy what you do. Do what you are passionate about. No matter what life throws at you. In my spare time I like to call myself a Woodworker. I have a small wood shop in my garage, and I do my best to make furniture and what not for the house, as time, and budget permits. When I saw a title on Woodworking, written by someone with as much enthusiasm for the craft as I, while being pleasantly surprised to find it written by a comedic talent whom I enjoy on television I had to give it a try. I wasn't disappointed! Nick Offerman is a well recognized character actor, and notable Hollywood comedian. I'm only famous at my address. What makes Nick and I the same, and thus my attraction to his book, is our title as craftspeople, instilled with the desire to work with our hands, building and designing with wood with a complete understanding that regardless of our lot in life, to a degree we are one in the same. Like most people who dabble in the wood craft, our devotion to a skill, that still utilizes 14th century tools, while accepting the fact that no matter how much time and effort one applies, to the craft, it cannot be perfected is humbling at best. It is the quest for knowledge, and like-minded people that continues to fuel our desire to make sawdust with the outside hope that a piece of furniture, or a bookcase, or a shelf, or a picture frame, finds its way into a home with the intent of providing a domestic (decorative) need, while ultimately satisfying the craftsman. This book was a delight! I found it entertaining, insightful, reflective, and humorous, and it kept my attention from start to end. 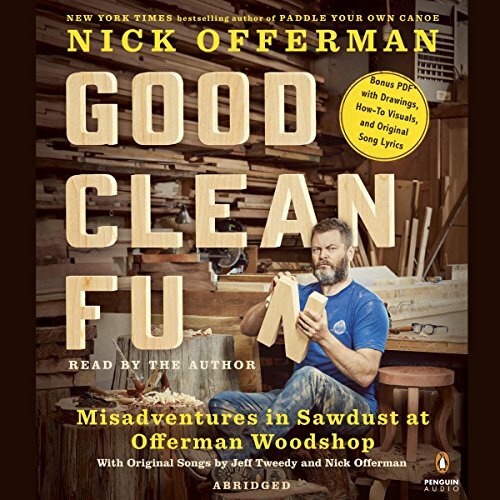 His droll delivery along with his woodworker quips kept me listening and had me on Audible, and Youtube immediately following, looking for additional titles by Nick Offerman. Regardless of whether you're a woodworker, you may find this title as fulfilling and insightful. You will be educated and entertained from the get go, and may even inspire you to go make some saw dust. I heard an interview, probably on NPR, of Nick Offerman, about this book before it was released. Now, I don't know what it's like to read this book on the page, but Nick reads his own book and his pacing, vocabulary, inflection and storytelling are like a room filled with a trestle table, a fine century-old chest of drawers, and framed in live-edge timbers filled with burr puzzles. When I'm driving around and I'd rather be making sawdust, listening to Nick describe a table saw or a jointer is music to the woodworking soul. I'm no wood magician myself, but work it because I love it. I feel it was passed down to me from my grandfather to my father and now me - my father's eldest daughter and only grandchild (of a dozen) of my grandfather to continue woodworking on a regular basis. Thank you, Nick, for reading your own book. It's a real treasure. Nick Offerman is great and I love how he teaches about his craft in this book. I am a wood worker myself and I think this is great for either someone wanting to get started or an experienced woodworker. although I love Nicks performance and his well written style that articulates his passion for woodworking very well it did not offer anything for me being a well-seasoned woodworker. The book was essentially 40 chapters of what tools are and the personalities of the people who work at his shop and his woodworking Heroes. if that's what you're looking for it's a five-star read. It was essentially a biography of Offerman's woodworking heroes and coworkers. His performance was excellent. Maybe I was expecting too much about woodworking but the story was kind of boring. It was very heartfelt about his employees but it didn't really do it for me. This definitely is best heard in the author's original voice. It wouldn't sound correct any other way. I'm an avid woodworker and really appreciate the visibility Nick has brought to the general public about our craft. I'm also excited to read a 'mainstream' book about woodworking. That said, the projects described I wasn't really into. And although I appreciate all the talented people in his workshop and am glad they got their due I didn't really have a connection with these people to really get into their stories. Incidentally due to Nick's slower speech (I listened to this as an audiobook) this is one of the few books I could actually listen to at 250% speed. Since I listen for entertainment though and am typically not trying to rush through, take for it what you will that I listened to it quickly. Again, I'm really glad this book was made, it just wasn't really my cup of tea. An amazing book about wood and woodcraft from a modern wood enthusiast slash dancing clown. I'm going to relisten to this because it made me weep with laughter on the inside and made me excited to go into my small garage and take metal implements to dead trees. If you like woodworking I think you'd enjoy this book. if you want to learn about woodworking this is a good book to get you started on a few projects and maybe give you some inspiration. If you are just a fan of nick and could care less about wood, well this book is still captivating and hilarious but I would recommend starting off with one of his other books but I think you'd find this just fine as well. Great. Nick Offerman is wonderful!!! Nick Offerman is one reason I have got into woodworking. A tip of the hat to you sir.